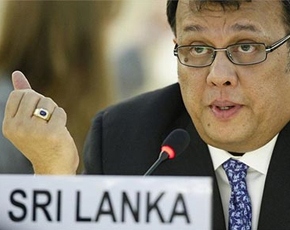 “We note that in the Report, the Office of the High Commissioner has gone beyond the mandate granted under resolution 19/2 which limited her role to reporting on the provision of technical assistance in terms of OP3 thereof,” pointed out Minister Mahinda Samarasinghe. When speaking, Leader of the Sri Lanka Delegation Mr. Mahinda Samarasinghe said, “The OHCHR has ventured into territory not envisaged by L.19/2 by making substantive recommendations. The recommendations contained in the Report introduce substantive measures which are totally unrelated to the mandate under 19/2. “The Report refers several times to the United Nations Secretary General’s Advisory Panel of Experts’ (PoE) Report on Sri Lanka. We requested the OHCHR to delete all references to the PoE Report as it was not referred to in the Resolution 19/2, and therefore reference to it in the OHCHR Report expands the ambit of the Report beyond the original scope and mandate of that Resolution, he said. He further said, As we pointed out in our statement to the High Level Segment of this Session, the Government of Sri Lanka in good faith facilitated this visit. The OHCHR team engaged in a dialogue with Sri Lankan counterparts, carried out field visits and held consultations with selected segments of the Sri Lanka polity. The High Commissioner herself appreciates that open access was granted. We wish to express our strongest reservations as to the content of the report on Sri Lanka as well as the procedure followed in formulating this document which bears number A/HRC/22/38. This report purports to be pursuant to Resolution L. 19/2 which we have rejected. We also question how a technical mission, after a visit of just over a week, could have produced such a document purporting to be a comprehensive report pursuant to L.19/2. We have already placed on record the numerous inaccuracies and misconceptions which mar the report in an Addendum numbered A/HRC/22/38/Add.1. We note that in the Report, the Office of the High Commissioner has gone beyond the mandate granted under resolution 19/2 which limited her role to reporting on the provision of technical assistance in terms of OP3 thereof. The OHCHR has ventured into territory not envisaged by L.19/2 by making substantive recommendations. The recommendations contained in the Report introduce substantive measures which are totally unrelated to the mandate under 19/2. The Report refers several times to the United Nations Secretary General’s Advisory Panel of Experts’ (PoE) Report on Sri Lanka. We requested the OHCHR to delete all references to the PoE Report as it was not referred to in the Resolution 19/2, and therefore reference to it in the OHCHR Report expands the ambit of the Report beyond the original scope and mandate of that Resolution. Furthermore, the PoE Report on Sri Lanka was commissioned by the UN Secretary General as a private consultation and is not the product or a request of the UN Human Rights Council, or any other intergovernmental process. Neither has it received the endorsement of any intergovernmental body. Hence, it has neither credence nor legitimacy. In its Report, the three-member Advisory Panel also makes it clear that the assertions set out there in remain unsubstantiated and require a higher standard of proof. For these reasons among others, the GoSL does not recognize the PoE Report, and is perplexed as to the rationale behind it being invoked extensively in the OHCHR Report. We also have concerns regarding the conduct of the OHCHR team who immediately after their return to Geneva, chose to brief a selected group of countries at an event hosted by a third country even before sharing the outcome of their visit with Sri Lanka either in Colombo or with the Permanent Mission in Geneva. Our Permanent Representative had, at the time, raised these concerns with the High Commissioner. It is interesting that the new draft resolution borrows heavily from the language of the OHCHR Report. I submit that follow up action based on a collection of inaccuracies and misconceptions is in itself fatally flawed. As we pointed out in our statement to the High Level Segment of this Session, the Government of Sri Lanka in good faith facilitated this visit. The OHCHR team engaged in a dialogue with Sri Lankan counterparts, carried out field visits and held consultations with selected segments of the Sri Lanka polity. The High Commissioner herself appreciates that open access was granted. In sum, it appears that the report is the outcome of no more than an information gathering exercise that has served as launching pad for a fresh resolution, rather than an attempt to stay within the bounds of strictly following-up on L.19/2 which stipulates the requirement of consultation and concurrence on the provision of technical assistance, consistent with Resolutions 5/1 and 5/2. Despite its dissociation from L.19/2 and measures pursuant to that action in the Council, Sri Lanka has never ruled out cooperation with the High Commissioner for Human Rights. We have had a Senior Advisor to the UN Country Team from the OHCHR since the aftermath of the tsunami of December 2004. In my former capacity as Minister for Human Rights, I hosted the High Commissioner’s predecessor Madam LoiuseArbour’s visit to Sri Lanka, and her visit during the humanitarian operation in 2007 was characterized by open and constructive engagement. From 2008 onward, the Senior Advisor from the High Commissioner’s office contributed to the process of formulation of the National Action Plan on the Promotion and Protection of Human Rights. This demonstrates our willingness to work with the Office of the High Commissioner. As we have stated on many occasions, we have invited the High Commissioner to visit Sri Lanka since April 2011 in pursuance of our ongoing engagement. Despite her finding time to visit the region in the recent past, in particular her visits to the South Asian sub-region within the past 12 months, she has not been able to schedule a visit to Sri Lanka when she could see for herself the remarkable transformation taking place in the day to day lives of citizens after the defeat of terrorism in 2009. For these reasons, we would request Members of this Council to critically evaluate the content and scope of this Report to ensure that an unhealthy precedent should not be established. I would also urge you to resist all attempts to use such a flawed and misconceived document to be the basis on which this Council contemplates taking further action.